Individuals applying for a degree or certificate program must submit required materials prior to the first day of the semester. Applicants who miss the deadline, may register as a non-degree-seeking student and apply for degree seeking status the following semester. The admission process varies depending on the student’s status: degree or certificate, non-degree, high school, transfer, or international. Some programs have admission requirements that are more restrictive than the college’s general admission requirements. Requirements may include, but are not limited to, minimum age, completion of specific courses, minimum grade point average, minimum test scores, interviews, auditions, and submission of a portfolio. The college may restrict enrollment in a class or program because of limited space, staff, or equipment. Non-degree seeking students do not have to complete the admission application process. Submit proof of the MMR vaccination if applicable. Enrollment Services will complete transcript evaluations for admitted students only. Enrollment Services may require students to submit course descriptions to determine content equivalency if the course content is not apparent or a catalog is not available. They will refer questions about equivalency to the appropriate academic department, who may also review the coursework to determine if it meets prerequisite requirements. The Records Office will determine academic status and credits acceptable towards an associate’s degree or certificate program. Students may challenge the decision of the Records Office. Casper College does not accept religion specific courses. Students who have earned a C or better in a college level political science or history course that covered the U.S. constitution may be able to take POLS 1100 in lieu of one of the courses used to satisfy the U.S. and Wyoming constitutions course requirement. Students must receive a C or better in POLS 1100 to satisfy the requirement. Contact Erich Frankland to request permission to take POLS 1100 or call the academic assistant at 307-268-2368 to schedule an appointment. Submit ACT, SAT, or ACCUPLACER placement test scores. Submit transcripts (in English) that verifies the completion of a high school diploma equivalent or leaving certificate and all college transcripts if you have attended college elsewhere. Casper College will issue an acceptance letter and a Form I-20 once we receive all required documents and deposits. This will give you F-1 student status. You can make the embassy visa interview appointment once you receive the Form I-20. The cost for tuition, fees, room, board, housing deposit, books, and health insurance (if needed) will be approximately $15,500. Casper College will provide you with the exact amount needed after application for admission. Non-degree Seeking Students. Non-degreeseeking students (those not working toward a degree or certificate) are not required to complete a full application for admission or submit transcripts. These students are not eligible to receive most forms of student financial aid and are not assigned academic advisors. They may use student services staff for assistance. Non-degreeseeking students may register and make course changes via WebAdvisor or myCCinfo, U.S. mail, or in person in Enrollment Services. Course schedules are distributed across campus each semester. Become familiar with the schedule before registering for classes on WebAdvisor or my CCinfo. Synonym. This is a code assigned to a course; entering synonyms is an easy way to register on WebAdvisor or myCCinfo. Section Numbers. Courses with multiple sections are assigned section numbers. Section numbers that start with an “N” indicate the class is offered online. 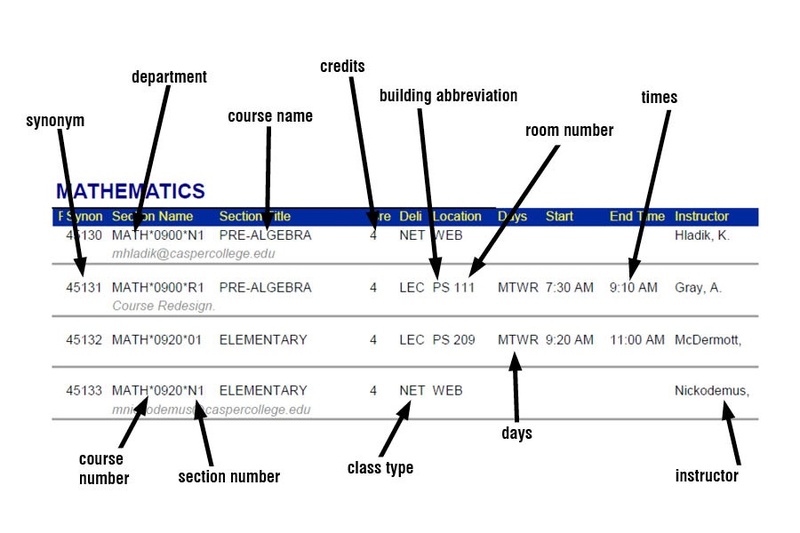 Section numbers that start with an “H” indicate hybrid classes where part of the class is offered online and part of the class is offered face to face. Section numbers that start with an “R” indicate self-paced class that meets face to face. Credits. This is the number of credits a class is assigned; some classes are only worth partial credit, indicated by .5 or .33. Class type. Indicates the delivery format for the class. Example: lecture, lab, practicum, Internet-based, independent study, etc. Have access to the class schedule for reference. The registration site is time limited. Go to the college’s website at or after your assigned date and time. *Contact the ThunderGeek Help Desk at 307-268-3648 with any password issues. Enter the course synonyms, one per line, in the SYNONYM column. The synonym field is semester and course sensitive. 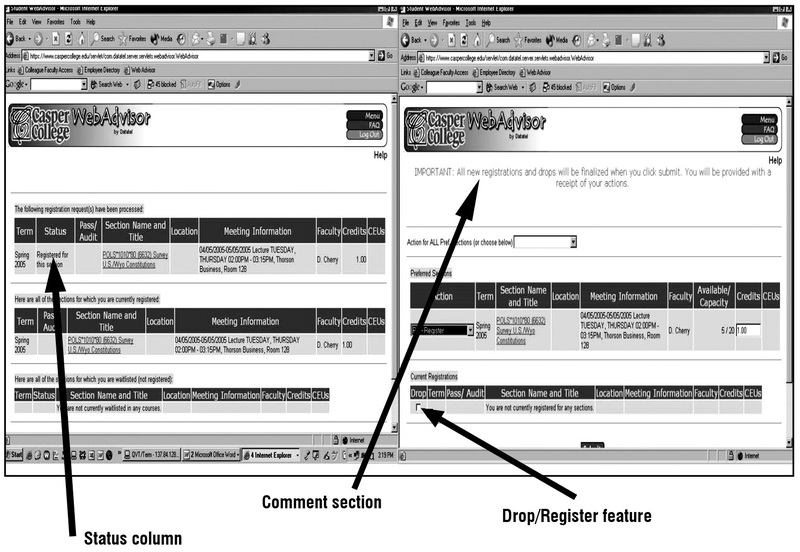 The subject, course number, section number, and term columns will automatically fill in. Section Closed. Choose to be placed on the waitlist or return to the registration screen and enroll in an alternate section. Students who enroll in an alternate section will be removed from the corresponding waitlist. Enrollment Services will notify students on waitlists via email if a slot opens. Students then have 48 hours to enroll in the class or the next person on the waitlist will be offered the slot. Enrollment Services notify students still on the waitlists prior to the beginning of the semester to select another course or contact the instructor to request permission to enroll in the course. Prerequisites. These are courses students must complete before they are allowed to enroll in specific courses. Students who think they have already met a prerequisite at another institution should contact Enrollment Services, their advisors, or the course instructor if they think they are qualified to take the class without completing the prerequisites. In the case of a math or English class, contact the respective placement coordinator: The English placement coordinator can be reached at 307-268-2383 or jhughes@caspercollege.edu or in person in Strausner Hall, room 108. The math placement coordinator can be reached at 307-268-2520 or cstewart@caspercollege.edu or in person in Physical Science, room 336. Math and English placement charts are available on the website, under placement tables. Courses that Require Instructor Permission. Students should contact their advisors or the instructor of the course to get permission to enroll in the course and to sign a course registration add form. Students who secure permission may register through Enrollment Services. Username and Password Does Not Work. Contact the ThunderGeek Help Desk at 307-268-3648 for assistance. To change from credit to audit after the withdrawal date, students may submit a Petition Form to Enrollment Services. Petitions may be granted for extenuating circumstances. Poor performance in a class does not constitute an extenuating circumstance. Changing from credit to audit may affect a student’s financial aid. Faculty members submit a faculty-initiated withdrawal (FIW) request to the Records Office for students who fail to attend scheduled course sessions for two consecutive weeks. Faculty may submit a FIW between the fourth week of the semester (the second week for summer semester) and the withdraw deadline date. The Records Office notify students with a FIW. Students may remain in the class by responding to the Records Office in person or writing within 10 calendar days and immediately contacting the faculty. Students who do not respond within 10 days will be withdrawn from the course, and a withdrawal (W) will be recorded on the student’s transcript. Students who want to drop or withdraw from all courses in a semester should submit a completed Complete Withdrawal Form to Enrollment Services. Withdrawals from full semester courses made by the withdrawal deadline date will be recorded on the student’s transcript as a withdrawn (W) course. After the withdraw deadline date, the student must obtain the instructor’s permission and submit a completed Petition for Exception to Enrollment Services by the following deadlines. Petitions for late withdrawal and exception to the refund policy are only considered for exceptional circumstances (those which are unforeseen and beyond the student’s control). Casper College reserves the right to cancel any class due to extenuating circumstances such as low enrollment. Students who receive financial aid and are enrolled in less than 12 credits should check with the Financial Aid Office to determine the impact on their award. Students should verify their class schedule before the beginning of the semester. Textbooks and required special course supplies are available for purchase at the Jack McCann College Store located on the first floor in the Student Union. Costs will vary per course. Wyoming Community College Commission establishes student tuition. The trustees of each community college individually establish other fees and charges (fees), which are published by each individual community college. All tuition and fees are payable according to each community college’s payment schedule published for each term. The individual community college must receive payment before any transcripts will be released. Each community college publishes its own payment and refund policies and procedures. Residence classification shall be initiated for each student at the time the application for admission is accepted. Students may request a review whenever they have not been in attendance for at least one semester. Individuals who are financial dependents or under the age of 24 who have a parent, guardian, or spouse who lives in the State of Wyoming. He or she has been employed within Wyoming for at least a majority of the twelve (12) consecutive months immediately preceding the student’s application for resident tuition. Graduates of a Wyoming high school. Recipients of a high school equivalency certificate in Wyoming who also qualify for a Hathaway scholarship. Individuals who have been awarded resident tuition status at another Wyoming community college or the University of Wyoming. Individuals with a permanent home in Wyoming. A variety of factors are considered to determine permanency including evidence of one year continuous full-time employment in Wyoming, home or property ownership in Wyoming, one year of continual presence in Wyoming, reliance on Wyoming resources for full financial support, Wyoming vehicle registration, Wyoming address on the most recent federal income tax return, valid Wyoming driver’s license, utility bills in the individual’s name, lease or rental agreements, certificate of marriage, and Wyoming voter registration. No one factor determines residency. Anyone using transferred Post-9/11 GI Bill benefits (38 U.S.C. § 3319) who lives in Wyoming while attending a school located in Wyoming (regardless of his/her formal State of residence) and enrolls in the school within three years of the transferor’s discharge or release from a period of active duty service of 90 days or more. Anyone described above while he or she remains continuously enrolled (other than during regularly scheduled breaks between courses, semesters, or terms) at the same school. The person so described bust have enrolled in the school prior to the expiration of the three year period following discharge or release as described above and must be using educational benefits under either chapter 30 or chapter 33, of title 38, United States Code. Students who do not meet the above requirements, who are not U.S. citizens or permanent residents except as provided by criteria 2 and 3 above, or who hold a valid nonimmigrant status in F-1 and F2, H-3 and H-4, J-1, K-1, and J-2, M-1 and M-2, Q-1, and R-2 visas except as provided by criteria 2 and 3 are considered non-residents. Tuition and fee charges for a semester are due and payable at the time of registration. The college must receive full payment no later than the payment deadline. Accounts not paid or without payment arrangements by the deadline will be subject to additional fees and possible submission for collection. Payment information for each semester is available in the current semester schedule or online at WebAdvisor or myCCinfo. Accounting and Financial Management (AFM) mails statements prior to the start of a semester and monthly thereafter. Students must maintain a current address on file with Enrollment Services. Students who do not receive a statement must request one from AFM and pay by the payment deadline. 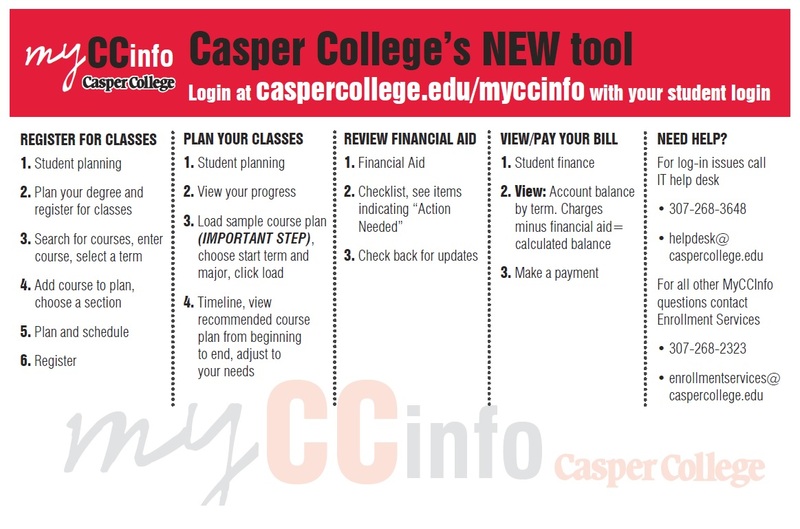 Students can view account information online through WebAdvisor or myCCinfo; a Casper College username and password are required. Tuition payments may be made by telephone with a credit card, by mail, online through WebAdvisor, myCCinfo, or in person. To avoid additional charges, students should verify that all expected financial aid has been credited to their account prior to due dates and payments sent by mail have arrived. Failure to make payment by a deadline will result in extension/late payment fees. These fees will not be waived. Students whose home institution is the University of Wyoming or any other university must pay tuition to Casper College by the payment deadline for any Casper College course for which they are enrolled. Students must contact AFM prior to the payment deadline to make arrangements if their federal financial aid or other funding sources, including financial aid issued by another institution, trust fund distribution, or payment by employer or other parties, will not be available prior to a payment deadline. Note: Casper College tuition will not be deducted from financial aid issued by another institution. Failure to make arrangements will result in extension charges. Casper College offers a three-payment plan for fall and spring semester and a two-payment plan for summer semester. Payment Plan Agreements are available through the Casper College website and AFM. The college will place a hold on a student’s records when an account balance or payment plan payment is past due or there is an outstanding balance, regardless of arrangements. 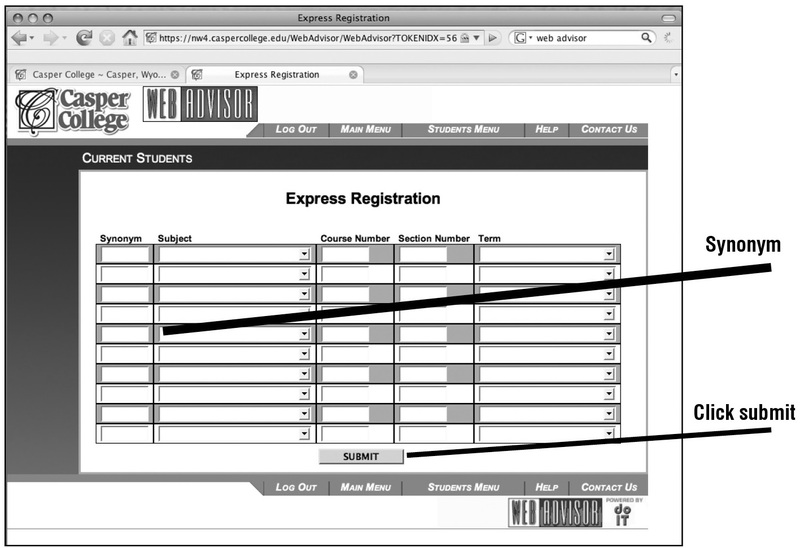 This action prevents any new registrations, issuance of academic transcripts, etc. The college will only release a hold when the account is paid in full with cash or a cashier’s check, credit card, or money order. There is a two-week delay from the date of deposit before the hold is released if paying with a personal check. The college will place holds on other records for students who incur a debt during a semester and who have already registered for a subsequent semester. The college will delete subsequent semester registrations for students who do not pay their debt by the billing statement due date. Refunds are available for tuition and fees, room, and board under specific criteria. AFM will calculate refunds following the end of the refund period. They will mail refund checks to the student or credit the credit card account for payments made by credit card. Students requesting an exception to the refund policy must submit a petition to the Vice President for Student Services. Petition forms are available in the Nolte Gateway Center, third floor, or call 307-268-2323. Students who do not withdraw entirely and have applied for fall and spring housing forfeit their deposit after 5:00 p.m. on August 8, 2017. Students who applied for spring housing only forfeit their deposit after 5:00 p.m. on January 2, 2018.